Students presenting and discussing their posters as part of the conference. What caused the Arab Spring? How can we slow the spread of the Ebola virus? What makes the American political system so volatile in 2018? These questions and more were discussed at the First Northeast Regional Conference on Complex Systems (NERCCS 2018) sponsored by the Center for Collective Dynamics and Complex Systems (CoCo). In fact, those questions were all discussed in just one keynote talk by Yaneer Bar-Yam from the New England Complex Systems Institute. Other keynote speakers asked questions about whether endothelial cells dream of eclectic shape (Katie Bentley from Boston University), if robots can be designed to work collectively (Kirstin Petersen from Cornell University), how to best combine the philosophy and science of change (Patrick Grim from Stony Brook University) and many more. Moderater fielding questions for Bar-Yam's keynote address which was done via webcam. So, how can all these things be related? It’s because complex systems are, well, complex. Unlike statistics that say one very clear thing, complex systems attempt to see how each factor influenced or changed a situation. A properly developed system can tell us which factor had the most influence, what factors need to change to adjust the outcome and what we can expect to happen in the future. 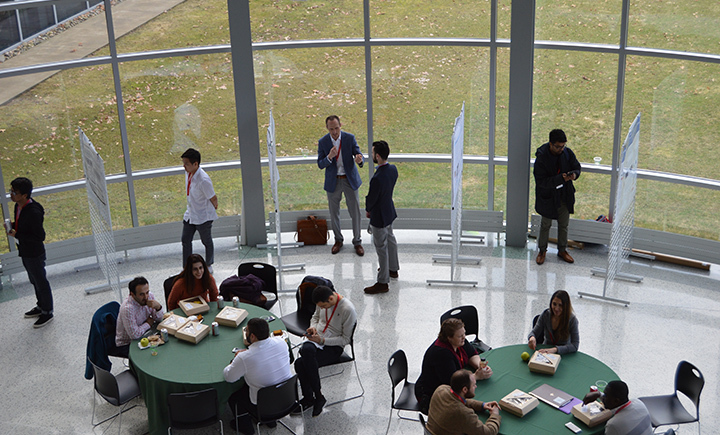 The conference itself included numerous keynote and invited speakers from across the northeastern United States, parallel sessions, poster presentations and a day for young researchers and post-docs to network. 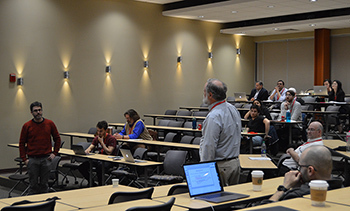 The parallel sessions brought together various researchers to provide 15-minute presentations on subjects including network structure, nonlinear dynamics, data-driven approaches, network dynamics, social networks, self-organization and collective behavior, social dynamics and information. Papers that were presented at the conference also had the opportunity to be published in the first-ever CoCo academic online journal titled Northeast Journal of Complex Systems (NEJCS). For those interested in the content of the conference, all of the keynote and invited speakers’ talks are available to watch on the CoCo Vimeo page. There’s also a twitter timeline that follows the events of the conference. Some of the biggest questions of our time can be looked at through complex systems science, and conferences like this one help bring that to light, Sayama said.